Today was an unusual day for me, because when it started I had nothing to do. Absolutely nothing. I’d had a successful present-shopping Saturday, the house was satisfactorily clean, there was no football on. I could spend it however I liked! I decided to take advantage of this fact to make a trip to Manchester. As exciting at the Liverpool art scene is, I’ve been hearing about good things going on just down the M62, and have been meaning to explore for myself for a while. So, with Chris coming along too, I decided to take advantage of this opportunity to visit 3 venues. Railway Cottage, Castle Street, Manchester. My first stop was somewhere I’ve been meaning to visit since it first opened in October. Saul Hay is a commercial gallery near Deansgate station, right next to the canal. I’d wanted to visit because I knew they were showing work by artists I have seen and enjoyed before, and I wasn’t disappointed. 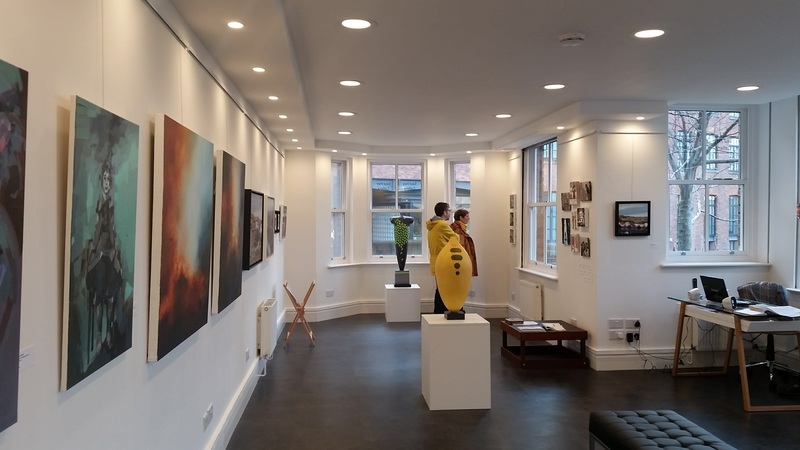 The space has been entirely curated by Ian and Catherine Hay, who have chosen to open by showing the work of artists they like – not a bad place to start. From a few works you get a sense of what each artist is about and while they’re all different, they somehow work well next to each other. Alongside artists I was already familiar with – and I always enjoy seeing the works of Josie Jenkins and Mandy Payne – it was a pleasure to discover new artists. Omid Asadi’s leaf cut-outs captured so many different emotions, and Melinda Matyas’ The Silence of the Animals was a piece I found particularly still and powerful. The opening of any new space for promoting art should be celebrated and based on how this debut show has been selected and put together, Saul Hay has a great future. I’m sure I’ll be back. Hewitt Street, Manchester. Miniature World is on until 22nd January. An unplanned stop, but as it was recommended to me by Ian at Saul Hay and was a less-than-5-minute walk away to behind Deansgate station, it would have been rude not to visit. Their current show, Miniature World, struck me as very similar in ambition to the current exhibition at Liverpool’s FACT (which I wrote about here for Art in Liverpool), in that they’re both about using art to pursue knowledge and understanding, to try and make sense of the world. Here, big ideas are brought down to a small scale, perhaps to try and make them relatable. There are some good things in here. Both Chris and I liked Hondartza Fraga’s Okeanos (lace), showing a new and intricate perspective on the world. 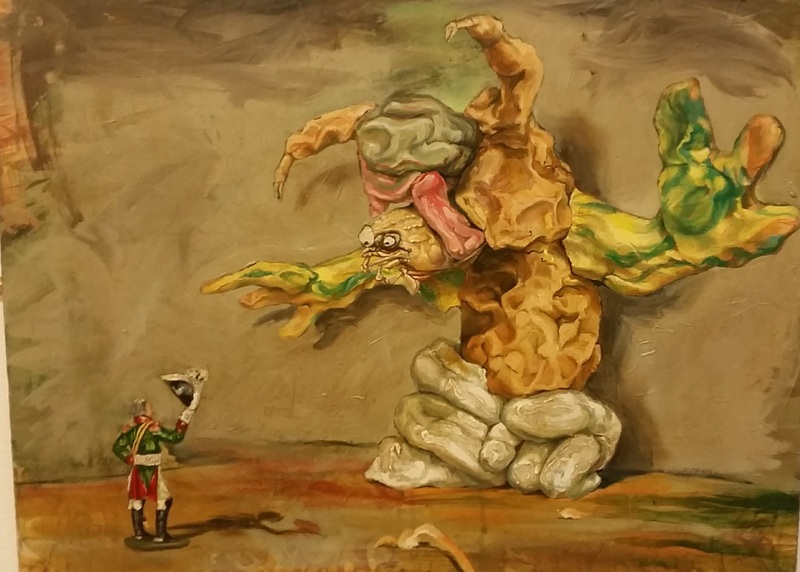 There was also something appealing, and yet slightly horrifying, about Iain Andrews’ quasi-Victorian scenes of soldiers and monsters. Whilst there were good things however, I didn’t feel that it quite came together as an exhibition – there didn’t seem to be a link other than “small”. Perhaps I’m being unfair and trying to read too much into things, or perhaps I’m too influenced by how well the diversity of vision works at FACT. I just felt that trying to pull these things together took away from the individual artists. Maybe a comment about the Warhammer? First Street, Manchester. 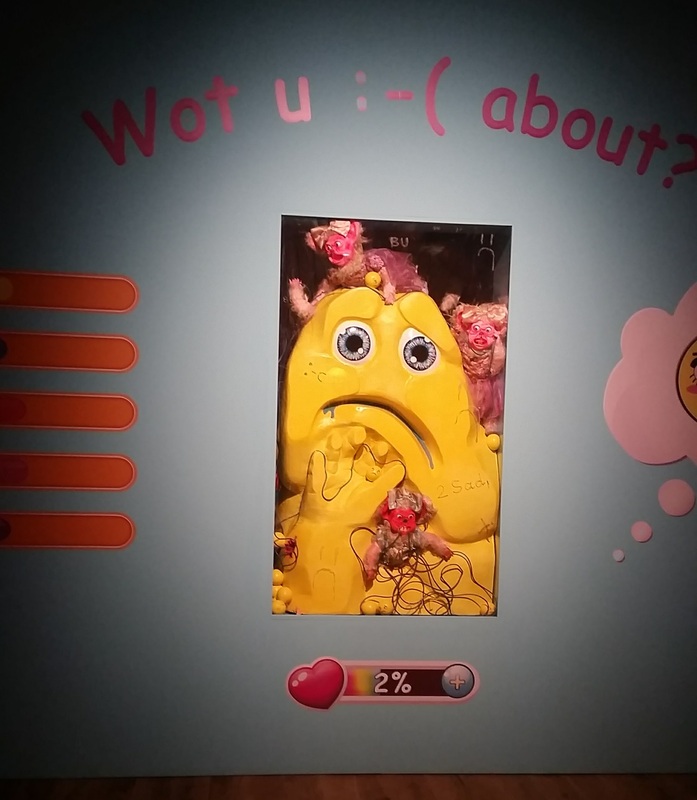 Rachel Maclean: Wot U 🙂 About? is on until 8th January. Although a spot of Christmas shopping did need to be done, gift inspiration was happily swift to hit. This meant there was time to head back to our just-off-Whitworth-Street gallery explorations. Of the shows we saw today, this was at the very least the strangest. Rachel Maclean’s distinctive imagery is about a lot of things. It’s primarily about our relationship with the digital world, about the people we are in and outside of the Internet. Here’s the thing: the message that the virtual world may not necessarily be healthy for us isn’t new now. The popularity of everything from Black Mirror to mindfulness courses is tapping into our collective recognition of this fact. Indeed the film installation is Wot U 🙂 About?, which seemed to both me and Chris to just reiterate this point, was the weakest part of the show. But with her physical objects, the sculptures and paintings, Maclean is far more thoughtful. She’s the only artist I can think of in any medium who, rather than just saying “We Want Data”, also considers what drives this desire. Her cheerful colours and almost huggable shapes draw you in, appealing to quite base instincts learned in childhood. It takes a while to recognise that the details are far from perfect – that man in the painting looks exhausted, that the figure absorbed in her phone has literally been gnawed away. They’re surprising and awful details when you notice them, almost too late. It takes time, too, to realise just how omnipresent the horrible data-eating rats are. These characters are letting this ruin happen to themselves. Even if some elements of our day in Manchester were disappointing (to The Deansgate pub: this is not a pie), the art wasn’t. Exploring new places is always interesting and there was so much freshness and vision here. I’ll be keeping it in mind for the next rare occasion I have an empty day on my calendar. This entry was posted in Exhibitions, Home, On my travels and tagged art, gallery, independent, Manchester, technology, virtual reality. Bookmark the permalink. Let’s Talk About: The Two- Hundred-Thousand-Dollar-A- Night Man.